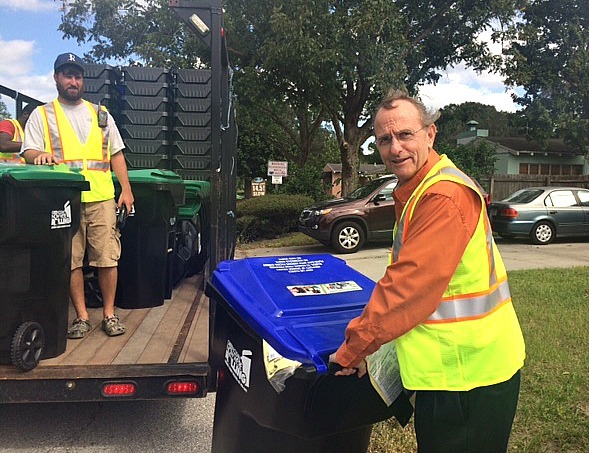 On his way to the office on a recent morning, District 5 Orange County Commissioner Ted Edwards strapped on a safety vest and made an important stop at Teriwood Avenue in Orlando to help deliver new garbage and recycling roll carts to local residents. Between now and mid-December, nearly 205,000 Orange County residents will receive two, 95-gallon garbage and recycling roll carts for the new Automated Curbside Collection Program that begins Jan. 1, 2016. The new garbage roll cart with green lids will hold three times more trash than a regular size can and will be collected once per week. The blue lid cart is for recycling. With the change, residents will receive a $35 per year savings on their collection services. District 6 Commissioner Victoria Siplin and District 3 Commissioner Pete Clarke also pitched in with cart distributions in the Tangelo Park and Lake Conway areas, respectively. The new Automated Curbside Collection Program is a result of Mayor Teresa Jacobs’ Sustainability Initiative, which began in 2013 as an effort to plan for future population growth in a way that enhances the quality of life for current and future generations. The plan, “Our Home for Life,” outlines specific incremental and transformative changes for the County through 2040, leading towards a more prosperous, healthy, livable, and connected community. To learn more about the County’s new Automated Curbside Collection Program visit www.ocfl.net/GreenClean2016. Residents may also call the Solid Waste Hotline at 407-836-6601 or email Solid.Waste@ocfl.net.